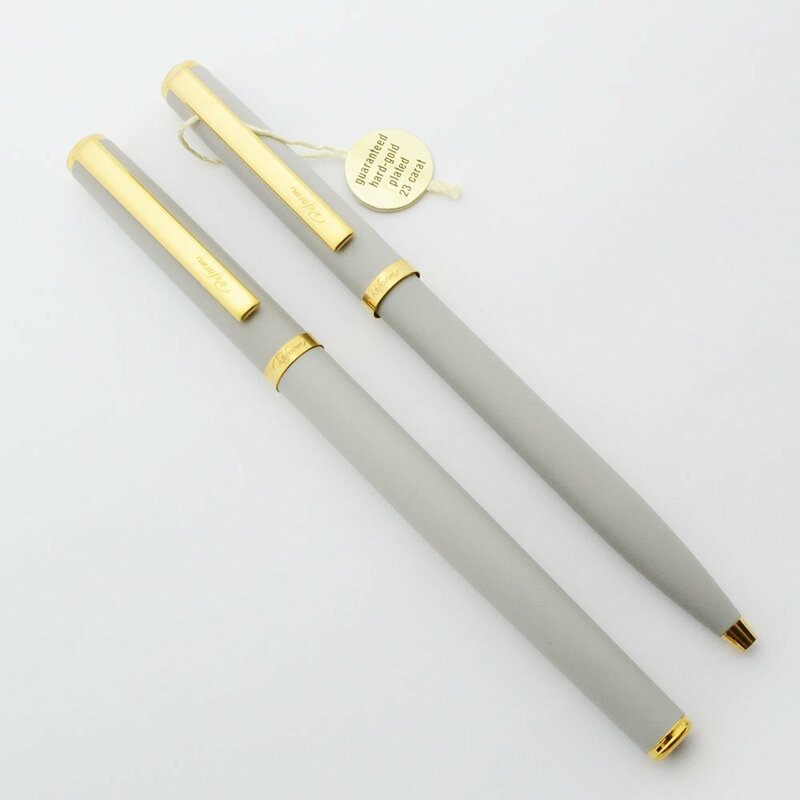 Reform pen set consisting of a fountain pen and a ballpoint pen. Both are satin gray with gold plated trim. 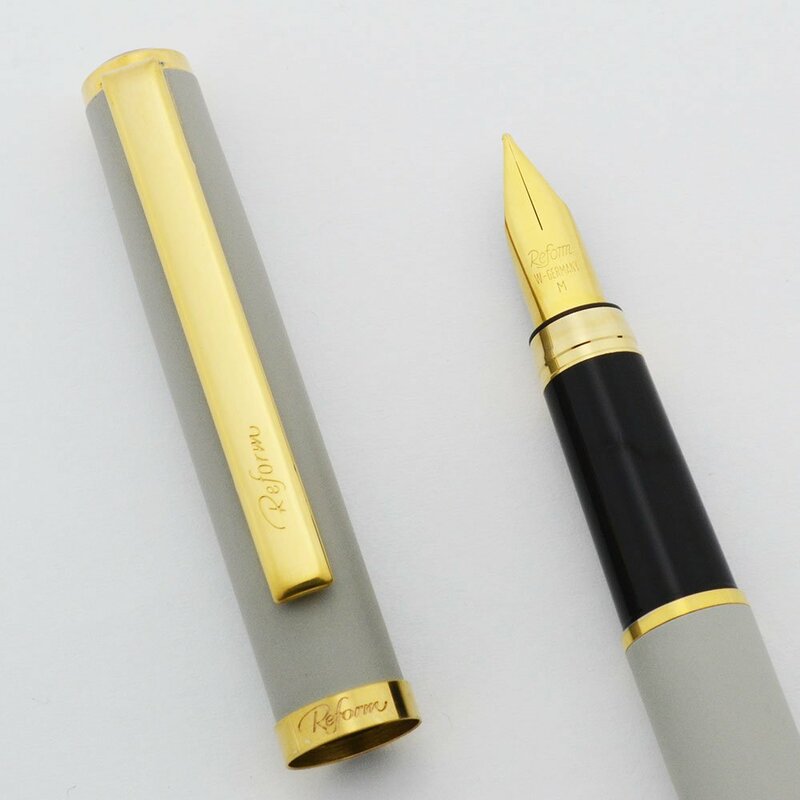 The fountain pen has a medium gold plated nib and is a cartridge/converter pen. The ballpoint pen is cap actuated. An original clip tag is included. Near Mint condition set. Manufacturer and Year Reform, W. Germany -- Likely 1980s or 90s. Length The ballpoint measures 5-5/16" and the fountain pen measures 5-1/2". Filling System The fountain pen is a cartridge/converter filler. A dummy cartridge is installed and a dried short cartridge is in the barrel. The ballpoint pen takes Parker-style refills. A working blue refill is installed. The tip extends and retracts via pressing down on the cap. Color Both have 23k gold plated trim and a satin finished gray cap and barrel. The section on the fountain pen is black. Nib MEDIUM gold plated nib. The nib is marked M. It is firm and writes smoothly. Condition Near Mint condition. No chips, dings, dents, or personalization. They look completely unused and have nearly no markings despite having a finish that collects them. An original clip tag is included.